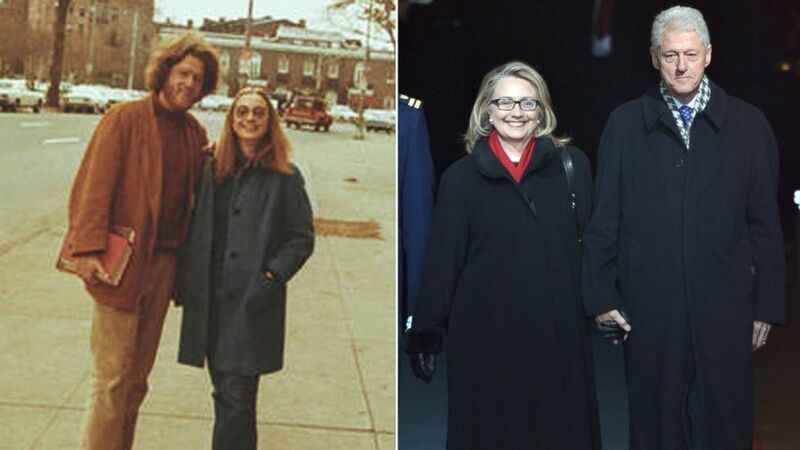 A look back on the Clintons' relationship on their 40th anniversary. camera (Clinton Family Historical Collection | Getty Images) Bill and Hillary Clinton seen together in this undated photo. Right, Former President Bill Clinton and then-Secretary of State Hillary Clinton arrive for the 57th Presidential Inauguration ceremonial swearing-in of President Obama at the U.S. Capitol, Jan. 21, 2013, in Washington. Just days before the first Democratic debate, the Clintons will be celebrating their 40th wedding anniversary. Bill and Hillary met in 1970 at Yale University after multiple encounters in the school’s library. A few days after meeting, the couple went on their first date. Hillary Clinton, in a 2003 interview, told ABC News' Barbara Walters their meeting was an "immediate attraction." Below are some of the highlights of their journey from Arkansas to the White House (and possibly the White House again?) and their relationship over the years -- the good, the bad, the happy and sad. After graduating from law school in 1973, Bill took Hillary on her first trip overseas. The couple vacationed in England, where Bill proposed on the shores of Ennerdale. Hillary declined the proposal saying she loved him but needed time. Despite getting a “no” the first time, Bill proposed again. Once they returned from Europe, Hillary moved to Arkansas to find a job. Not having much luck, Hillary decided to visit her family, and on the way to the airport she fell in love with a home in Fayetteville, Arkansas. A few weeks later Bill bought the modest house and asked her to move in with him, hoping she would then agree to marry him. Hillary finally said yes. The soon-to-be Clintons married in the living room of their new home, on Oct. 11, 1975. The small, intimate ceremony was attended by 15 guests. After tying the knot, several hundred friends joined the newlyweds for a backyard reception. The couple honeymooned in Acapulco, Mexico courtesy of Hillary’s mother, Dorothy Rodham. In an interview with “BBC Newsnight” in India, Bill Clinton admitted that the couple made a pact -- a 52-year pact. “I know a lot of people don’t believe me when I say this, but we’ve had a great life,” Clinton said. During an emotional interview with CNN’s Jake Tapper, the former president opened up about his leading lady. "Whenever I had trouble, she was a rock in our family," Clinton said. "I trust her with my life, and have on more than one occasion," he said, describing his wife as someone who helped him through some of the most trying times of his life. Days after Bill Clinton admitted to having an affair with White House intern Monica Lewinsky, he gave a speech that resonated well with the nation. “Indeed I did have a relationship with Miss Lewinsky that was not appropriate. In fact it was wrong. I misled people. Including, even my wife. I deeply regret that,” Clinton said. Polls following the speech in 1998 indicated that the majority of Americans were willing to accept Clinton, as reported by ABC News. A big moment in the Clinton relationship was when their only daughter, Chelsea gave birth to their only grandchild, Charlotte on Sept. 27, 2014. The Clintons released a statement that day, saying they are "blessed, grateful, and so happy to be the grandparents of a beautiful girl." Hillary and Bill both tweeted the day Chelsea announced she was pregnant and Hillary tweeted out a picture with Charlotte when she was born. My most exciting title yet: Grandmother-To-Be! @billclinton and I are thrilled that Chelsea and Marc are expecting their first child! When the former president turned 69 years old in August, Hillary Clinton was out on the campaign trail and missed her husband’s birthday bash. However, she Tweeted “Happy birthday!” to her better half and attached an old photo of the two of them. "The most difficult decisions I have made in my life were to stay married to Bill and to run for the Senate from New York,'' Clinton wrote about the Lewinsky affair in "Living History," her first memoir. In an interview with ABC News’ Barbara Walters back in 2003, Hillary admitted finding out about her husband's affair. "That was probably the worst moment that I can even imagine anyone going through because what he told me that morning was that he had not leveled with me or anyone else. He had not told me the whole truth about what the relationship was," Clinton said. "And I was furious. I was dumbfounded. I was, you know, just beside myself with anger and disappointment." "The jury was really out about whether the marriage would survive, whether I wanted it to survive," Clinton recalled. During Bill Clinton's first campaign for president, rumors flew around that Bill Clinton had a mistress, Gennifer Flowers. Flowers claimed they had a 12-year relationship, Clinton denied it. In a famous "60 Minutes" joint-appearance in 1992, Bill Clinton admitted his marriage had problems but ultimately defended it, "You're looking at two people who love each other. This is not an arrangement or an understanding. This is a marriage." Hillary explained: "I'm not sitting here some little woman standing by my man like Tammy Wynette. I'm sitting here because I love him and I respect him and I honor what he's been through and what we've been through together. And you know, if that's not enough for people, then heck, don't vote for him." In celebration of 40 years of marriage through it all -- this one's for you H+B.